In high school, I worked many hard jobs that offered little pay or job satisfaction. One job I took was with a local carwash. 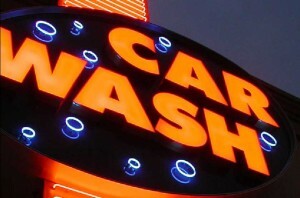 This carwash was awful, and routinely broke the atennae off cars. We were order to try to “cover it up” so the people behind the wheel would not see it and blame us. One day I went into work, looked for my timecard in full view of the manager and the other employees, and couldn’t find it. After looking for at least two minutes, I turned to the boss and said, “I can’t find my timecard.” he replied, “That’s because you don’t work here anymore!” And laughed aloud. I wasn’t exactly devastated, but the way he did it was a real shock. A year later, the carwash closed down, and I saw the manager leaving the place with a box of belongings. I drove up and said, “Tough luck!” And laughed aloud. This entry was posted on Thursday, July 30th, 2009 at 11:26 am. You can follow any responses to this entry through the RSS 2.0 feed. You can leave a response, or trackback from your own site.